October 21, 2015. This date is important in movie lore as the day Marty McFly & Doc Brown travel to in Back to the Future Part II. 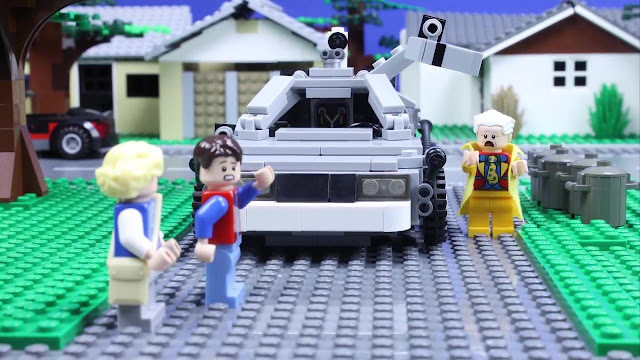 YouTube user MonsieurCaron, whom I've featured on nerdyviews before for his wonderful work doing LEGO Ghostbusters stop motion, has applied his talents to Back to the Future with this short little gem titled "Brick to the Future." Once again, it's full of awesome and has some very familiar mini-figs and vehicles in supporting rolls. Check it out! MonsieurCaron has also made a game out of it by challenging you to find some of the LEGO hidden in the video such as Ant-Man, Captain America's shield and the Flash. Plus there are three additional Ghostbuster references that I think are pretty hard to miss. You can check out more of his awesome LEGO work at BrickFun.net.